Not to be confused with Biplane or Canard (aeronautics). A tandem wing aircraft has two main wings, with one located forward and the other to the rear. Both wings contribute to lift. In cases where the rearmost tandem wing is smaller than the forward wing, such that it resembles an oversized tailplane, it is referred to as a "Delanne wing". A tandem wing configuration has two main wing planes, with one located forward and the other to the rear. Both wings contribute to lift. In a tandem wing design the lift vectors on the two wings are spread far apart longitudinally, allowing them to act together to achieve stability and control. This distinguishes it from the biplane, in which the wings are stacked more or less vertically, one above the other, and a separate horizontal stabiliser surface is required, and from the canard or "tail-first" configuration in which the forward surface is much smaller and contributes primarily to control and/or stability. 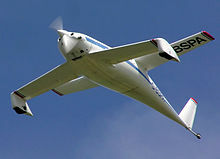 Where the rear tandem wing is smaller than the forward wing, such that it resembles an oversized tailplane, the arrangement is sometimes called a "Delanne wing". Tandem wings have also been used on Ground-effect vehicles. Langley Aerodrome - 1890s-1900s, Langley's first tandem wings were steam-powered unmanned aircraft, manned attempts in 1903 failed to achieve take-off. Montgomery Aeroplane and The Santa Clara tandem wing gliders - 1903-1905. Miles, George H (27 April 1944). "The Tandem Monoplane Its Merits and Drawbacks Compared with those of Tailless, Tail first and Allwing Designs : Libellula Suggested as Name for Class" (pdf). Flight.